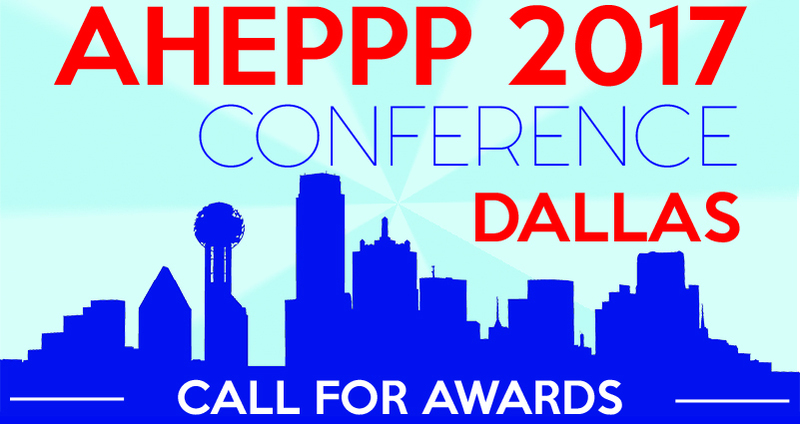 The AHEPPP National Conference provides our association with the opportunity to recognize some of the shining stars and promising practices in the profession. The Awards Selection Committee invites nominations for our annual awards. Nominate yourself, your institution and/or a deserving colleague! Award submissions are due by 5:00 p.m. on October 4th Monday, October 9th at 5 p.m. EST. Questions regarding the 2017 Awards criteria or evaluation process should be directed to Nicki Jenkins, 2017 AHEPPP Awards Chair, [email protected]. This award recognizes an institution of higher education and its professional(s) in the field of parent and family programs who have developed and implemented an innovative and creative program, resulting in improved activities, services and communication for/with parents of undergraduate students. One award will be presented for each institutional size as indicated above. Send submissions to [email protected]. Please include the institution and award title in the subject line (i.e. XYZ University - Best Institutional Initiative, Mid-sized). These awards recognize institutions of higher education and its professional(s) who have developed outstanding materials, both print and/or electronic, that contribute to the field of parent and family engagement. Nominations are invited for each of the five categories. Nominations will be judged on content, as well as innovative and functional design. Note: Institutions that previously won an AHEPPP publication award will not be considered for an award in a consecutive year for the same publication. Send submissions to [email protected]. Please include the institution and award title in the subject line (i.e. XYZ University - Excellence in Publication - Magazine). This award recognizes a professional in the field of parent and family programs who has had an important impact on the body of knowledge about, and practices of, engaging parents and families in an institution of higher learning and whose achievements have advanced this profession on any of its aspects. The recipient should have published articles, survey analyses or books. The work should address appropriate parent engagement in regard to student development. Letter of nomination (must be a staff member of an AHEPPP member institution). This letter should provide a description of the nominee’s accomplishments/contribution to research and or/literature and the manner in which the work addresses parent engagement. Send submissions to [email protected]. Please include the nominee's name and award title in the subject line (i.e. John Smith - Outstanding Contribution to Research and/or Literature). This award recognizes a professional in the field of parent and family programs who has had a significant impact on the profession. This individual’s achievements have advanced the profession in any of its aspects. The recipient should have a distinguished record of contributions to the profession, such as mentoring young professionals, creating innovative programming or collaborating with other institutions. Letter of nomination (must be a staff member of an AHEPPP member institution). This letter should provide a description of the nominee’s achievements and his or her impact on/contributions to the profession. Send submissions to [email protected]. Please include the nominee's name and award title in the subject line (i.e. John Smith - Outstanding Contribution to the Profession). The Powerful Partnership Award acknowledges and encourages successful collaborations where partnerships did not exist. The purpose of this award is to recognize outstanding partnerships (internal and/or external) and to gather information about effective relationships that exist across institutional lines. The award also seeks to highlight how the program/initiative has positively impacted parents and family members. Letter of nomination (must be a staff member of an AHEPPP member institution). This letter should provide a detailed description of the powerful partnership being nominated and how it has positively impacted parents/family members. The letter should also state the roles that each department/entity is responsible for in the partnership. Send submissions to [email protected]. Please include the institution name and award title in the subject line (i.e. XZY University - Powerful Partnership Award). This award recognizes a new professional who has demonstrated service to AHEPPP, and/or to the parent and family programming profession. Nominees can have no more than four years of professional experience in the field of parent and family programming. Send submissions to [email protected]. Please include the nominee's name and award title in the subject line (i.e. John Smith- Outstanding New Professional). This award recognizes a professional who has demonstrated service to AHEPPP, and/or to the parent and family programming profession. Nominees must have at least four years of professional experience in the field of parent and family programming. Send submissions to [email protected]. Please include the nominee's name and award title in the subject line (i.e. John Smith- Outstanding Professional). This award recognizes a graduate or undergraduate student who has impacted the parent and family program at the institution in some way. Examples include student assistants, tour guides, orientation leaders or other positions held by a current student. Please provide details of the student’s accomplishment or impact as it relates to enhancing the parent and family program. Send submissions to [email protected]. Please include the nominee's name and award title in the subject line (i.e. John Smith- Outstanding Graduate/Undergraduate Student).